Have you tried my fantastic coconut oil fudge yet? After I’d made that recipe many times, I decided to switch it up a bit and add some peanut butter. (Because peanut butter and chocolate is, of course, one of the best flavor combinations.) This peanut butter coconut oil fudge is a delicious twist on the original: all the chocolately goodness plus rich, nutty peanut butter flavor. 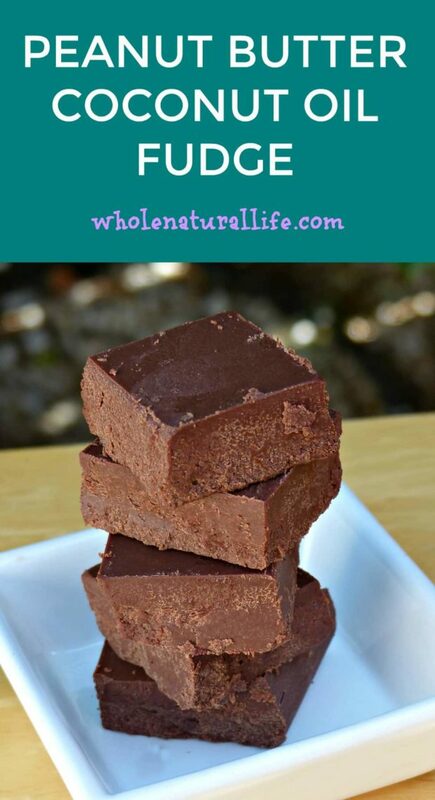 Like my other coconut oil fudge recipe, I love this recipe because it’s really simple to make and is a tasty way to add more healthy coconut oil to your diet. It also keeps really well in the freezer, so I usually make a double batch and then we get to enjoy it for quite a while. If you don’t like the taste of coconut oil, you can try substituting refined coconut oil for the virgin coconut oil called for in the recipe. I haven’t tried this myself, though, so can’t comment on whether you will also have the adjust the amounts of the other ingredients. Immersion blender: I highly recommend using an immersion blender to ensure that the honey is thoroughly emulsified with the other ingredients. You CAN do this in your regular blender or even food processor, but I like using my immersion blender because it means I have fewer dishes to wash. (Fewer dishes is pretty much one of my life goals.) I have this immersion blender and have been very happy with it. 8 x 8 glass baking dish: I cool all of my fudge recipes in Pyrex baking dishes. When making a single recipe, I use this 8 x 8 baking dish. For a double recipe, I use this large rectangular baking dish. You can use any sort of glass or ceramic dish that you want. Coconut milk: I always buy this brand of coconut milk because it comes in a carton and is free of gums and preservatives. In my experience, the best price can be found at your local Asian market, but you can also buy it online here. Melt coconut oil in a small saucepan on your stovetop. Once coconut oil is melted, turn off the heat and add the cocoa powder, coconut milk, peanut butter, honey, vanilla and salt. Use your immersion blender to mix all ingredients directly in your saucepan. This may take a minute or two, depending on how powerful your immersion blender is. If at any point the mixture becomes too thick to mix, you can gently heat your saucepan again to reliquify your oil. Line a glass baking dish with parchment paper. Pour peanut butter fudge into your prepared pan, then transfer to the fridge to cool. If you want to speed up the process, you can also cool in the freezer. Store finished fudge in a lidded container in your freezer. Looking for More Ways to Add Coconut Oil to Your Diet? You should definitely check out some more of my coconut-rich recipes, like my coconut berry delights, lemon coconut delights, and homemade mint chocolates. And if that’s not enough, I have a whole e-book dedicated to coconut recipes. Check out the e-book here. 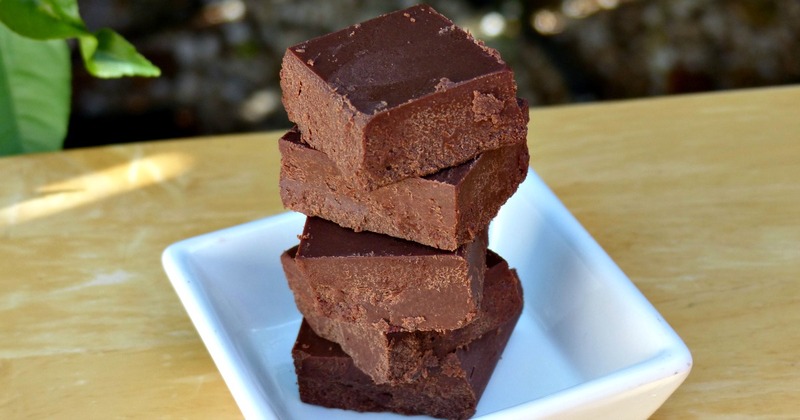 If you’re a fudge lover, I also recommend taking a look at my other healthy fudge recipes: dairy-free fudge and mint chocolate fudge. This is absolutely delicious! I subbed almond/hazelnut butter due to peanuts allergies. I followed recipe to a tee. Used organic virgin coconut oil. My coconut oil would not blend!! It stayed on top of the chocolate no matter how much I emulsified. Has this ever happened to you? Your fudge looks completely blended where mine has the firmed up coconut oil on the top so it appears opaque from the top. Oh no! I've made this recipe a bunch of times and that's never happened to me. I'm not sure what the problem is.